Running a lean business is a strategy that many industries have adopted. As with many innovations to production and business in general, the concept was pioneered within the automotive industry. The idea is to eliminate waste in product or production in your business while simultaneously satisfying customer wants. 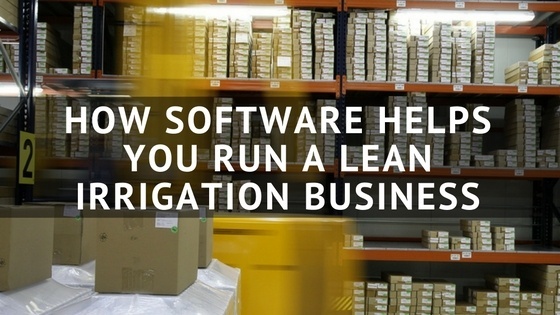 For irrigation businesses, there are numerous benefits to running a lean business. As Ruth King puts it, inventory is a bet. Each time you purchase inventory, you’re making a bet that you will sell those parts. It is a bet that the accounts you service are going to need those parts and a bet that you can sell those parts before they become obsolete or new models become available, which is a constant with irrigation controllers and panels. Running a lean irrigation business can be tricky when you have a larger customer base. You can have potentially hundreds of different parts on hand, but only regularly use ten of them for your work. That doesn’t mean that you can get by without having the rest in your inventory. So how do you manage all of it? How can you run a lean business and reduce waste in your irrigation business? Here is how software can help. Software helps you run a leaner business because you can track the parts that you hand as you go. If you order more of the same part number, you can enter that into your system. As you divvy up your inventory(some businesses will “sell” parts to techs, others will simply have a pool of inventory), you’re able to accurately track what is being used. Irrigation software allows your field techs to enter the parts used in the field, which will then diminish your total inventory that you have on hand. The ability to track the irrigation parts being used in real time helps for future ordering purposes. For instance, say a field tech uses a part on the job and they notice that their inventory in their truck is running low. With irrigation software, they have the ability to notify the office that they’re going to need to restock their inventory. For certain times of the season, you might be using more of one part than the others. For startups, you might need to have more valves or sprinkler heads on hand, but you might be able to have less on hand throughout the remainder of the year. By using your historical data and analyzing your past usage reports, you can come up with an accurate estimate of what you’ll need. The key distinguishing feature of a lean business is the reduction of waste. Waste doesn’t always come in the form of parts. Reducing waste can also mean increasing efficiency in processes. Efficient routing can reduce the waste of both time and money. Irrigation software helps route your field techs, which means they will be putting less mileage on their work vehicles. Less mileage can translate into potentially less issues. The wear and tear on your trucks is reduced, saving you money that you otherwise would spend on repairs. Operating your business using a lean model was difficult when inventory was done using pen and paper. Software can help you keep less parts on hand, but still take care of all of your customer needs.